Hey guys! 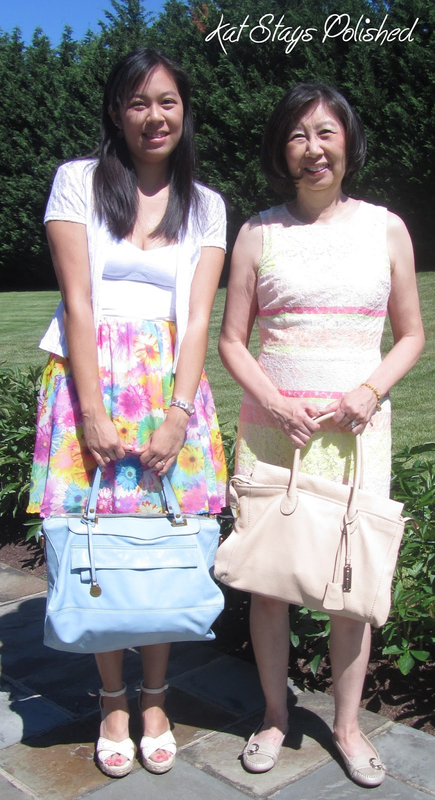 Today is another post on the fabulous Rabeanco bags I won back in May on Mother's Day weekend! Last weekend I traveled back to Maryland because my cousin was getting married. In between the time I won these bags [Bonham for me & Granville for Mom] and the wedding, my mom actually went and bought the dress I picked out for her that won me these bags in the first place! She looks absolutely adorable in this dress. The picture [and apparent bright sunlight] doesn't do her justice! She says she LOVES her bag and even has several organizers in it to keep everything tucked in its own little place. She filled it up quick--when I picked it up I about broke my arm because it was so heavy. Okay, maybe not that heavy, but she is making good use of it for sure. Anyway, here we are all ready to go to the wedding! The sun was super bright and I guess my camera didn't care, haha. If you want to see the bags and clothes without the sun interference, check my original entry post HERE. Check out what I keep in MY Rabeanco Bonham HERE. For more information on these bags, or any other RABEANCO bag, visit their website or chat with them on Facebook or Twitter! If you shop on their brand new website, enjoy the FREE SHIPPING to all 50 states.